There are some foods that make you want to lick your bowl.. or sing an opera. After the success of my Moroccan Chicken, Preserved Lemon and Olives Tagine (recipe forthcoming) a few weeks ago, I was once again tempted by the idea of a succulent, fork tender chicken tagine. It’s been a hot summer and I had bags of red and green peppers, cubanelle peppers and all sorts in the fridge. Why not a sweet, hot and sour tagine? Marinate chicken, spices, oil and onion for at least 24 hours. Heat the oven to 400F. Layer the sliced onions, carrots, peppers and tomatoes on the base of a oven-proof casserole or baking dish (since I don’t have a tagine… yet). Layer the chicken pieces (make sure they have some space between them). Sprinkle over the Ras-el-Hanout, salt and pepper and drizzle over oil oil. Cover with two layers of tin-foil and bake for 400F covered for 60 minutes. Take out of the oven, baste the chicken with the tagine sauce and cover again, plop back into the oven, reduce the heat to 375F and continue to bake for another 30 minutes covered. Remove the foil, pour in the honey and mix. 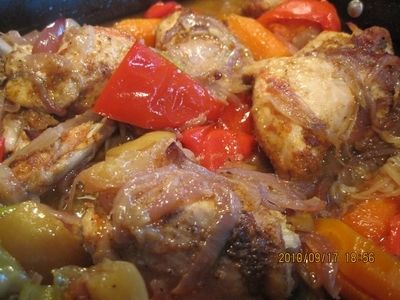 Taste it – it should be a pleasing balance of acidity from the lemon and the sweetness of the onions, peppers and honey. If you need a bit more sweetness, add more honey. Garnish with fresh cilantro leaves and serve with rice, bread or couscous. Deelish!